About Me: I'm a greeting card designer and licensing artist living in Phoenix. I'm an animal lover and cat junkie! 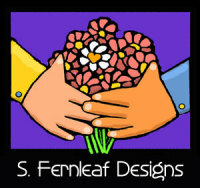 Visit my licensing website at: sfernleafdesigns.com. My gift shops: zazzle.com/blessingartanimals, and cafepress.com/blessingart. My blog: http://fernleafdesigns.blogspot.com/ Thanks for visiting! Welcome to S. Fernleaf Designs--Cards celebrating life with cats and other animals. Mostly cats. I hope you find the perfect card to put a smile on the face of your favorite animal lover! Congrats on your recent Design of the Day! I've enjoyed looking at your whole collection, and like the upbeat mood of all your artwork! Sharon, Congrats on your Design of the Day. What a wonderful idea and design. We love all of your cards! Wishing you many sales and continued success. I love your work so much. :) Great illustrations...super cute and funny. Sharon, Just stopping by to say I really admire your art! You have wonderful cards that are so fun! You have such cute and sweet cards! Love 'em! Hi Sharon - I've neen a fan for awhile - love your cards! I've featured one of your cards in my blog post this week. Lovely Cards Sharon, Congratulations On The Design Of The Day! Sharon, I love your Warm Fuzzies card! Congrats on your Design of the Day. What a sweet image.Thanks so much for your nice review. I LOVE your cards and sense of humor! What a great website! What great cards!! Thank you for the wonderful card. Like your sense of humor, and the way you design your flower cards - very beautiful! You have a wonderful collection here. Love the supportive friends and Frienndship and treats in particular, but there are so many others too! What a creative mind you have. You will do very well here!!! Hello Sharon - I just love your store with the animals and humor. Being a blessing is one of the goals of my life whether it be animals or friends. You are sure doing that. Cute drawings, too.